Nokia 3.1 was launched in India on Thursday at a price point of Rs. 10,499, and is only available in the 2GB RAM/ 16GB inbuilt storage configuration. The phone was initially launched in Moscow, alongside the Nokia 2.1 and Nokia 5.1, in May this year. 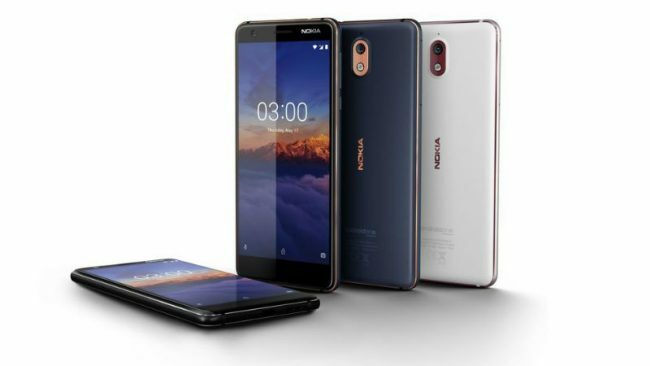 HMD Global, the licensee brand for Nokia phones, has launched the smartphone in the Indian market to compete with the likes of the Redmi 5, Redmi Note 5, Honor 7C, and Realme 1. Key highlights of the Nokia 3.1 include an 18:9 display, a 2,990mAh battery, Android One certification, and three twin-colour options. Nokia 3.1 price in India is set at Rs. 10,499 for the 2GB RAM/ 16GB storage variant, which is the only one HMD Global has brought to India. The 3GB RAM/ 32GB storage model is not available in the country yet. The smartphone has been launched in three colour options – Black/ Chrome, Blue/ Copper, and White/ Iron. Sale of the handset will begin from Saturday, July 21 across Paytm Mall and Nokia’s online store, apart from major retailers. Launch offers for the Nokia 3.1 include a couple from Paytm Mall – customers buying the smartphone from an offline retail outlet by scanning the Paytm Mall QR code will be entitled to 10 percent cashback on subsequent recharges and bill payments on Paytm. Customers buying the smartphone are also eligible for two Rs. 250 movie cashback vouchers which can be redeemed against booking minimum two movie tickets via Paytm. Lastly, ICICI Bank credit and debit cards are entitled to 5 percent cashback on purchase. In terms of telecom offers, Idea and Vodafone users will be given certain benefits. The dual-SIM (Nano) Nokia 3.1 runs Android 8.1 Oreo, based on the Android One programme, out-of-the-box. It sports a 5.2-inch HD+ (720×1440 pixels) panel with an 18:9 aspect ratio and protection courtesy Corning’s Gorilla Glass. The handset is powered by an octa-core MediaTek MT6750N, coupled with 2GB/ 3GB of 16GB/ 32GB of eMMC 5.1 storage. In terms of optics, the Nokia 3.1 smartphone sports a single 13-megapixel rear autofocus camera sensor with an aperture of f/2.0 and an LED flash. On the front, the handset gets an 8-megapixel fixed focus camera sensor with an f/2.0 aperture 84.6-degrees FoV. There is a 2,990mAh battery under the hood. Connectivity on the smartphone comprises of 4G LTE, Wi-Fi 802.11ac, Bluetooth 5.0, GPS/ A-GPS, GLONASS, Micro-USB, and a 3.5mm headphone jack. Sensors onboard the Nokia 3.1 include accelerometer, ambient light sensor, gyroscope, magnetometer, and proximity sensor.